In this installment of “Residents and Fellows,” Drs. 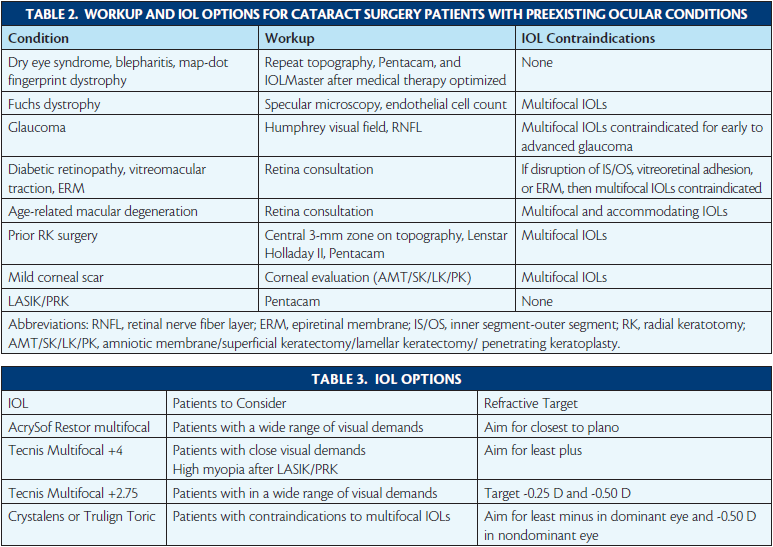 Ambati and Messenger provide an exceptional breakdown of how to approach cataract surgery in 2015. Patients’ expectations, how to handle comorbidities, pertinent diagnostics, patient counseling, intra- and postoperative considerations are all covered. This article is a must read! Cataract surgery options have evolved dramatically in the past decade, and so have patients’ expectations. The smorgasbord of lens options can overwhelm both doctor and patient. To customize the surgical plan for each patient, the eye care specialist must gather a considerable amount of information from the patient and genuinely view the patient as a partner in his or her care. It is important to get to know each patient as a person (Table 1). What does she do for work? What are his hobbies? Is he/she a glass half-full or a glass one-sixteenth empty type of person? Does he like wearing glasses or hate having to look for the right pair for a given activity? Would she like greater freedom from glasses for a range of activities? Does he work on a computer a lot? How long are his arms, and where does he hold things to read? Does she read primarily on a tablet computer, or does she like to read fine print in books or low-contrast newspapers in a dim room? Does he shoot? If so, which is his dominant eye, and where is the sight he needs to focus on? Does she drive a lot at night? If so, does she currently see rings around lights, and do they bother her? How old is the patient, and what is his general health and life expectancy? How much does she spend on glasses each year or however often she buys them? How many pairs of glasses does he have? Would she like to wear sunglasses without a prescription? Each of these questions sheds light on the patient’s needs, lifestyle, expectations, and visual demands. Seeking this information takes time and is best viewed as a journey on which you and your patient walk side by side, looking across and evaluating the landscape of the patient’s visual past, present, and future. A healthy patient who is 65 years old is likely to live another 20 years or more, so it is to be hoped that cataract surgery will produce excellent outcomes and be one of the best experiences of his or her life. The decision to undergo the procedure and the options chosen require careful consideration and full information. 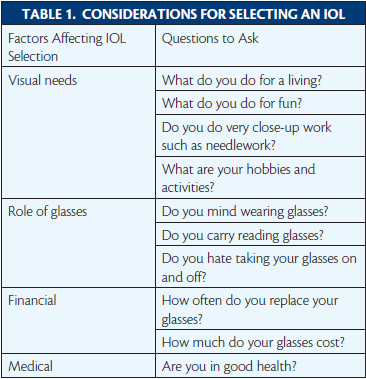 Preexisting medical conditions can limit a patient’s IOL options (Table 2). Macular degeneration, glaucoma, diabetic retinopathy, optic neuropathies, Fuchs dystrophy, corneal scarring, strabismus and amblyopia, epiretinal membranes, vitreomacular traction, and other retinopathies can limit visual potential due to damage to the tissues composing the visual axis. Affected patients are often poor candidates for premium lenses (eg, toric, accommodating, or multifocal IOLs). Dry eye disease and blepharitis, if not dealt with in a timely fashion, can affect the tear film, compromising preoperative keratometric measurements and potentially affecting refractive outcomes and patients’ satisfaction. High astigmatism may make it difficult to achieve a good refractive outcome with multifocal IOLs. Previous ocular surgery, including corneal, refractive, retinal, glaucoma, eyelid, or eye muscle, can pose challenges. Radial keratotomy (RK), laser vision correction (LASIK or PRK), and corneal transplantation can make the evaluation of keratometry difficult and induce higher-order aberrations to boot. A number of conditions can affect zonular stability and make intraoperative management difficult, including pseudoexfoliation; an axial length greater than 28 mm; and previous vitrectomy, scleral buckle, or trabecular surgery (including tube shunts and trabeculectomy). Eyelid surgery such as blepharoplasty is generally best deferred until after cataract removal, because the latter can affect lid position. Prior blepharoplasty can set the patient up for dry eye, which can in turn affect refractive outcomes. Previous strabismus repair may make a patient’s primary gaze appear well aligned but leave him or her with subtle misalignment in other gazes and potentially compromise reading vision with a multifocal lens. A careful examination for the conditions mentioned earlier can be complemented by several advanced corneal and retinal diagnostic technologies. Almost every cataract evaluation warrants several diagnostic tests: corneal topography, biometry/keratometry with partial coherence interferometry (IOLMaster; Carl Zeiss Meditec), Scheimpflug corneal analysis (Pentacam Comprehensive Eye Scanner; Oculus), and macular optical coherence tomography. If dry eye disease, blepharitis, map-dot fingerprint dystrophy, pterygium, or Salzmann nodular degeneration is present, the keratometric evaluations should be repeated after corneal optimization (medical or surgical). If surgery on the cornea is indicated, that delays cataract extraction, and the patient should be advised that a step-by-step approach will achieve a better final outcome. If there is any question of Fuchs dystrophy (cornea guttata, endothelial reflection brighter than epithelial reflection, morning blurriness, family history), specular microscopy should be performed and an endothelial cell count obtained. Fuchs dystrophy contraindicates multifocal IOLs but not accommodating or toric IOLs. If the patient has even early glaucoma, a visual field test (Humphrey; Carl Zeiss Meditec) and also a retinal nerve fiber layer analysis should be obtained, and the eye care practitioner should pay close attention to the papillomacular bundle to assess the macula’s visual potential. In the near future, multicolor retinal nerve fiber layer analysis with green-blue reflectance and macular thickness grid assessment will be available on the glaucoma module of the Spectralis (Heidelberg Engineering). If mild diabetic retinopathy, vitreomacular adhesion, or an epiretinal membrane is present, the eye care practitioner should pay close attention to the foveal contour and the inner segment-outer segment junction. If the foveal contour is disrupted, the patient likely will not be pleased with the visual quality of multifocal IOLs, but if the inner segment-outer segment junction is preserved, he or she might be pleased by an accommodating and/or toric IOL. Nevertheless, in the presence of one or more of these conditions, it is strongly advisable to obtain a retina consultation to decide whether laser, intravitreal injections, or surgery might be needed before, concurrently with, or after cataract extraction. If the patient has any macular degeneration, even asymptomatic drusen alone, ophthalmologists will generally be reluctant to offer a multifocal or accommodating IOL, although a toric IOL may be of benefit if the patient has high astigmatism. After refractive or other corneal surgery (including penetrating keratoplasty, RK, LASIK, or PRK), traditional keratometric approaches go out the window. In such cases, the authors rely on a number of indices: the 0-, 1-, and 2-mm keratometry from the EKR report on the Pentacam; the central 3-mm zone from Atlas topography (Carl Zeiss Meditec); and biometry with the Lenstar (Haag-Streit). For astigmatism, the average of the cylinder at the 2- and 3-mm zones of the Pentacam is taken, and the central topography or iTrace (Tracey Technologies) readings are analyzed as well. The advanced keratometric measures are averaged, and the Lenstar’s Holladay II consultant and recommendations from the American Society of Cataract and Refractive Surgery IOL calculation website and the website of Warren Hill, MD, are considered as well. Despite these measures, there is still an element of imprecision in eyes with previous corneal surgery, and a frank discussion with the patient about “shooting darts in a dark room” is warranted in this situation. On the plus side, patients with a history of refractive surgery are highly motivated to be less dependent on glasses. In particular, RK patients are familiar with daytime fluctuations in vision, risk, and imprecision, and these individuals stand to benefit from the range of vision available from presbyopia-correcting IOLs, because they are at risk for future hyperopia. In general, the AcrySof IQ Restor IOL +3.0 D (Alcon) is a workhorse for patients interesting in being less dependent on glasses, because the lens generally provides the best range of functional vision and an optimal peak near focal point for most patients. For patients who have very close visual demands (eg, jewelers, people who sew a lot, librarians) or those who have undergone high myopic ablations in LASIK or PRK, a Tecnis Multifocal IOL (Abbott Medical Optics) may be the best choice, as long as the patient understands that he or she may need glasses for computer vision or the computer may have to be moved closer or switched to a larger font. Patients receiving both the AcrySof Restor and Tecnis Multifocal IOLs should be informed about the chance that they will experience halos in the early postoperative period, that this phenomenon decreases with time, and that it can be dampened with eye drops if necessary. It should also be explained to prospective Restor patients that they will need bright light to read and, if they are trying to read a restaurant menu in dim light, for example, they may need to use their cell phone to light up the menu. Patients who have had hyperopic LASIK are generally not good candidates for the Restor or Tecnis Multifocal, due to the reverse spherical aberration induced by that procedure, but they could be great candidates for the Crystalens or Trulign Toric (both from Bausch + Lomb). They might also be good candidates for conventional IOLs with positive spherical aberration, such as the SN60AT (Alcon), if they are not interested in being less dependent on glasses. Various lens options are summarized in Table 3. The approach to targeting a postoperative refraction depends on the type of IOL chosen. For IOL calculations with Restor IOLs, we have found that it is best to shoot for plano. With Tecnis Multifocal +4 IOLs, on the other hand, we shoot for least plus. With either Restor or Tecnis Multifocal lenses, if there is zonular instability (eg, eyes with pseudoexfoliation, previous vitrectomy, or traumatic cataract), a capsular tension ring can be useful to stabilize the capsular bag. In addition, three-piece versions of each of these lenses are available for sulcus implantation with optic capture for additional stabilization. For toric IOLs, an axial length greater than 25 mm is an indication for a capsular tension ring to help reduce the rotational instability that occurs in longer eyes. Dense or bothersome floaters after multifocal IOL implantation may require a smooth vitrectomy by a retina surgeon. The new Tecnis Multifocal lenses with a +2.75 or +3.25 D add improve depth of focus by minimizing the dip in crispness that occurs in intermediate range with multifocal IOL technology. Specifically, the defocus curve for the new +2.75 D add lens shows that, between +0.50 D to -2.50 D power in optical distance, patients can be expected to see better than 20/30 (data on file with Abbott Medical Optics). This suggests that, if the surgeon shoots for -0.25 to -0.50 D with this lens, he or she can pretty much achieve 20/30 or better vision at distance, intermediate, and near (addressing patients’ common complaint of having difficulty on the computer with diffractive multifocal implants). This is an exciting development, and the introduction of the Restor +2.50 D add and the Restor Multifocal Toric further increase surgeons’ therapeutic armamentarium. Generally speaking, 2.00 D or less of cylinder can be managed with LRIs or arcuate incisions. From 2.00 to 3.50 D of cylinder can be managed with a Trulign IOL along with LRIs or arcuate incisions. More than 4.00 D of cylinder should trigger a careful evaluation for keratoconus; treatment of this degree of astigmatism may require a combination of a high-diopter toric monofocal IOL along with LRIs or arcuate incisions at the 7-mm optical zone. After LASIK or PRK, corneal astigmatism should be corrected at the 7-mm optical zone. If the patient is not a candidate for multifocal lenses based on considerations noted earlier (eg, Fuchs dystrophy, corneal scars, early glaucoma, mild diabetic retinopathy, epiretinal membranes) but does not want to wear glasses for most activities, a Crystalens or a Trulign lens may be valuable. Generally, with this approach, the dominant eye can be targeted for least minus and the nondominant eye for -0.50 D. Preoperative counseling should include an explanation of the blend of vision patients will achieve with both eyes working together. It is important for these patients to be engaged in working their ciliary muscles starting 2 weeks after surgery. Furthermore, they should use steroids for about 6 weeks after surgery (with careful monitoring of IOP) to minimize the risk of early capsular contraction. A target of -0.75 D sphere is appropriate in patients with Fuchs dystrophy receiving a monofocal IOL, because future Descemet stripping endothelial keratoplasty may cause a hyperopic shift. To some extent, the refractive shift can be compensated for by the accommodative range of the Crystalens or Trulign IOL. When a patient is receiving any of the premium lenses, the authors find that the undilated pupil should be marked prior to surgery, and the capsulorhexis should be centered on the undilated pupil with a diameter slightly smaller than that of the IOL’s optic. Proper alignment of the IOL’s haptics—on the astigmatic axis for the Trulign or at 6 and 12 o’clock for the AcrySof Restor and Tecnis Multifocal to aid centration on the pupil—is critical. Careful polishing of the anterior and posterior capsular leaflets is essential. Postoperatively, prophylaxis of cystoid macular edema with nonsteroidal anti-inflammatory drugs for 1 month is important. Understanding the astigmatic impact of surgical wounds, meticulously planning the astigmatic correction, and management of persistent cylinder with arcuate incisions, or laser correction if need be, are all crucial elements of reaching the optimal outcome for each patient. 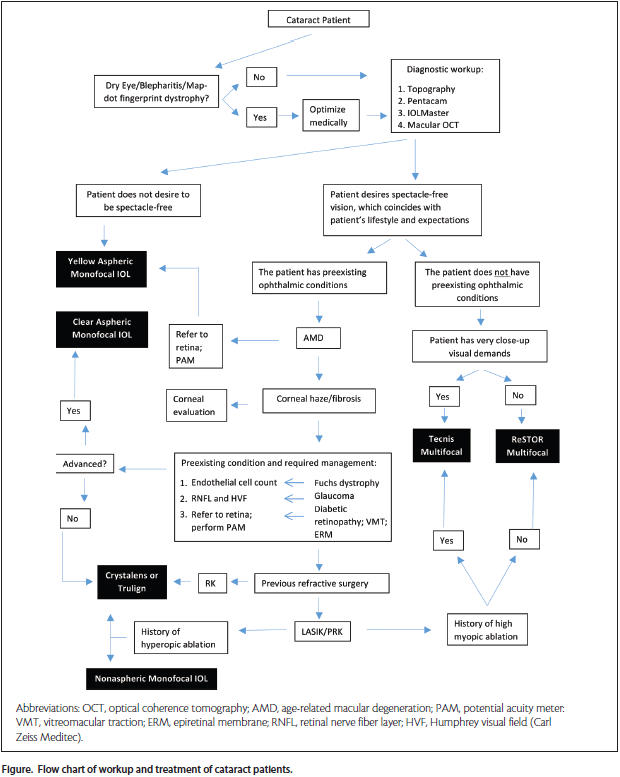 As a strategic overview of the authors’ conceptual approach, a flow chart to help guide decision making is provided (Figure).